Maria: What were you going to say? Lúcia: Let’s catch a movie today. Maria: I was going to suggest the same thing! 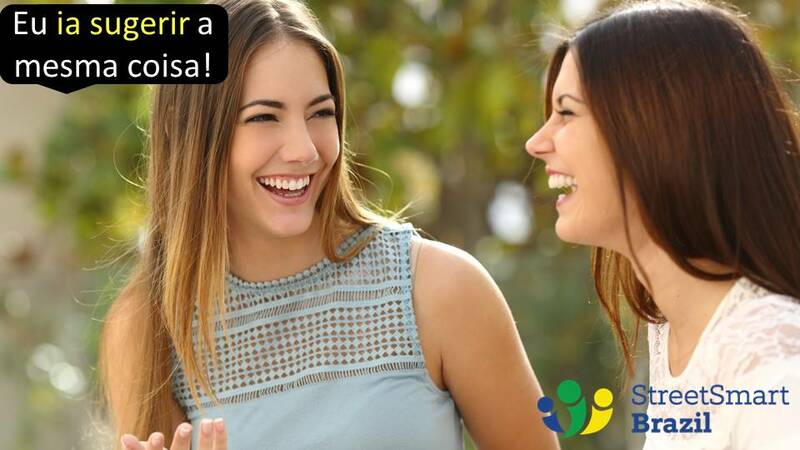 In this Portuguese lesson you will learn how to say that you were going to do something, such as when you ask someone: What were you going to say? Or when you say: I was going to suggest the same thing. It’s easy and very useful. Maria: O que você ia dizer? Lúcia: Vamos ao cinema hoje? Maria: Eu ia sugerir a mesma coisa! The verb Ir is an irregular verb that you should really know well. I have a lesson on the present tense of the verb Ir with tips for you to avoid common mistakes. See it here. I also have a lesson on how to express the future tense using the verb Ir in the present tense. It is the most common way to use the future tense in spoken Brazilian Portuguese. Visit the lesson here. Ontem eu ia jantar com Mauro, mas acabei tendo que trabalhar até tarde. = Yesterday I was going to have dinner with Mauro, but I ended up having to work until late. Clara ia pedir demissão, mas mudou de ideia. = Clara was going to quit her job, but changed her mind. João ia atravessar a rua quando o sinal fechou. = João was going to cross the street when the light turned red. This last example has something that I find very interesting. In Brazil, when the traffic light is red, we say that it is closed. When the light is green, it is open. Practice and advance your Portuguese with a Street Smart Brazil instructor. We offer Brazilian Portuguese lessons via Skype. With teachers in different time zones, you enjoy great flexibility when booking your lessons. How would I say I was going to suggest something different? Eu ia sugerir algo diferente. So to say: “That’s what I was going to ask” I would say “É isso que ia perguntar.”? Thanks! Could I use: Eu não ia dizer nada mas se você insiste. ?